Limited. Annual verbena can be grown through winter only in semi-tropical climates. Mix a standard application of a balanced organic fertilizer into the soil prior to planting. In midsummer, drench plants with a liquid fertilizer to prolong bloom time. 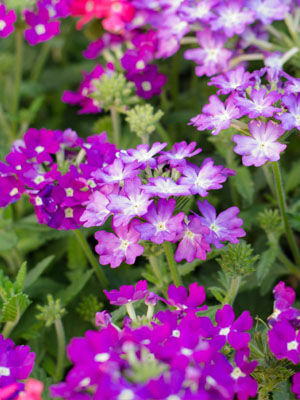 When growing verbena in containers, feed with a liquid fertilizer every two weeks. Petunia. Verbena’s low, spreading growth habit make it a good flower to grow in front of taller flowers, or as a trailing plant in mixed containers. Annual verbena may decline quickly when summer weather turns hot and humid. In warm climates, perennial verbenas may grow better than the annual form. Flower colors include blue, violet, purple, rose, dark red, yellow, salmon, white and many bicolors.